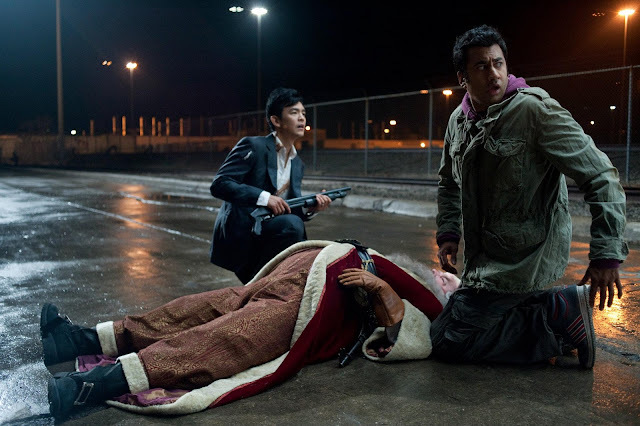 ‘Harold & Kumar’ Attempt A Miracle On 420th St.
Harold: I shot Santa Clause in the face. He’s real and I shot him in the face. 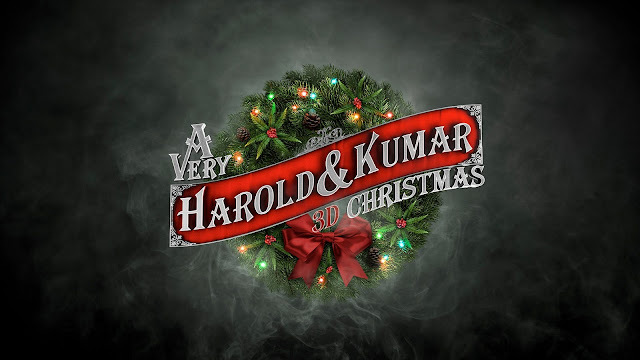 So now that Halloween has ended, what better way to rush into the holiday spirit than with the arrival of the first official Christmas film of the season – A Very Harold & Kumar 3D Christmas. The stoner comedy duo has returned for a third feature film, which had nowhere to go, but up, following the pretty terrible sequel, ‘Escape from Guantanamo Bay’, and fortunately this film manages to do just that. Unfortunately, the move upwards is not that high. This third installment in the series is incredibly hit or miss and while enjoyable for a good portion of its duration, it’s incredibly forgettable as well. While still striving to be offensive in an adorable sort of way, the interesting way the first film handled racial subversion is nowhere to be seen here either. What’s left is a raunchy Christmas story that reunites two friends, with mostly mixed results. As opposed to the last film, which took place mere minutes after the first film, ‘3D Christmas’ picks up with our heroes several years later. Harold and Kumar (Jon Cho and Kal Penn) have gone their separate ways after college. Harold now has a nice job and lives in his nice house, with his nice wife, Maria (Paula Garces). Kumar lives in the same old apartment, still getting the same old kind of high, and lost his old girlfriend (Danneel Harris). On the day of Christmas Eve, Kumar heads over to his estranged pal Harold’s house to deliver a package that was mistakenly brought to Kumar’s apartment. Things quickly take a bad spin, as Kumar accidently burns down Harold’s father-in-law’s (Danny Trejo) Christmas tree, which he had been growing for eight years prior. Hoping to fix the problem before Maria, her father, and the rest of her family come back home from Midnight Mass in the city, Harold and Kumar set out on a journey to find another perfect Christmas tree. Plenty of raunchy, yuletide shenanigans ensue, including encounters with mob bosses, interactions with the perfect Christmas gift, and another visit from one St. NPH. I went into this film fairly optimistic. I did enjoy the first film in this series. Not as much as some, but I did find it quite funny and appreciated the surprising amount of layers it had with regards to race relations of all things and the intelligence of the characters, while still serving as a stoner comedy about getting hamburgers. The second film, while I found some moments pretty amusing, was pretty terrible in a way that kind of ruined the goodwill set up by the first. Hearing the announcement of a third film did not really excite me, but the initial trailer managed to get me back into the fun spirit of watching these characters, along with simply providing a pretty solid two minutes of laughter. Once again, critiquing a comedy like this will come down to what I thought made me laugh versus how well I thought it managed to sell us on the adventures and growth these characters have. I certainly did laugh at a good number of scenes, but the problems with this film stem less from anything it is trying to say or be “cutely” offensive towards and more with the fact that a good amount of the humor falls pretty flat. To say more about the positive. I did laugh quite a bit during many scenes. The film takes a while to really get going, but once it does (basically once Harold and Kumar are back together) I appreciated the duo’s chemistry, a lot of their interactions with others, and some of the ways they address having gotten older. The film has a lot of obvious callbacks to the previous films, but some of those moments stick pretty well. It also takes some time to point out how self aware it is of being a 3D film, being another sequel, and referencing the actors real life personas (White House, Sulu), which is sometimes humorous. Putting the plot aside and observing a lot of the comedic set piece moments as separate entities, I did appreciate some moments a great deal. 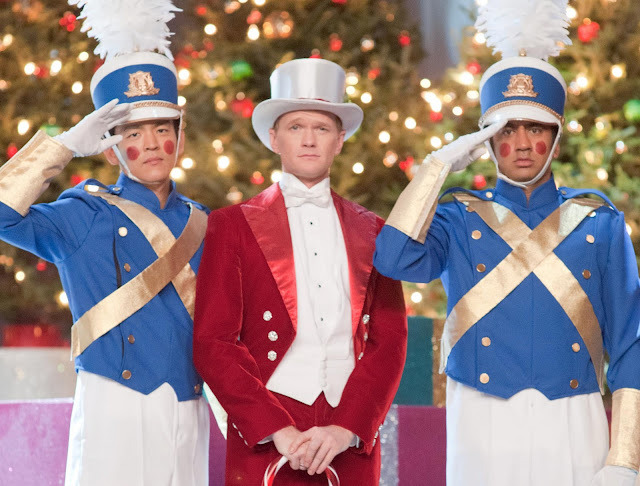 The two most notable of these moments involve a claymation sequence and, of course, Neil Patrick Harris. With the claymation scene, despite having seen sharper and more hilarious takes on this format in other recent Christmas-themed comedic media (Community and It’s Always Sunny in Philidelphia), it still gave me a chuckle to see the stars imagine themselves as claymated and be chased by a monstrous snowman. Regarding Neil Patrick Harris, it is basically the expected, obligatory showcase moment for him to return to the story that serves no real purpose besides being funny, but I did find it funny. Harris has come out about being gay in the time past, since the last film, and now we have him here (after surviving two shotgun blasts to the back in the previous film) playing himself as a person pretending to be gay. Regardless of his relevance to the film, his filthy take on his own persona continues to make me laugh. Where Harold & Kumar stumble is in its various attempts to keep other less important plots moving. During the early part of their journey, Harold and Kumar are joined by two of their new friends, Todd and Adrian (Tom Lennon and Amir Blumenfeld). Todd also has his young daughter on hand and a running joke involves her using various types of drugs. There is just something that never seems funny, every time the film cuts back to this joke. There are also plenty of race jokes that, for me, still range from mild chuckle to groan inducing. The lack of any commentary in regards to this humor just makes it stand out as jokes done in poor taste in an attempt to be offensive, but since it attacks many different targets, it’s ok.
Two more issues. One is in regards to the 3D. While this film was shot in the format and makes sure to go over-the-top with it, by throwing everything at you, the film does surprisingly little with it. It feels more like it just needs to remind you every 15 minutes or so that you are wearing those glasses by chucking something your way, as opposed to being clever with it. The other issue is in regards to making this film matter. It is nice that these guys are back and having fun, but the film has nothing to say about anything. Even the second film haphazardly addressed George W Bush’s terms in office. With this film being set during Christmas, something could have been brought up regarding…well anything really; consumerism, other holidays, more about family. There are some light dramatic stakes involving the duo’s friendship and the ol’ approval of your father-in-law story, but nothing really registers that significantly. I would not go as far to say that I don’t care for this series enough to see another one of these films, but there is very little here to make another one feel necessary. With that said I had a good enough time with a lot of the moments and did continue to enjoy Kal Penn and Jon Cho’s chemistry together. Cho is a fun straight man to Penn’s vulgar, stoner comic persona. I guess I just wish this film did more in the way of having meaning. Given that these films continue to have a lot of success in home media format, I can’t fault its popularity too much, but I don’t think this installment will be becoming a Christmas classic for that many people. One final note: I love Wafflebot. Neil Patrick Harris: Take care guys. I’ll see you in the fourth one.